Last week I had advised not to be on short side of Nifty and that the bulls have upper hand. Though Nifty could not cross resistance near 8322 as I had mentioned in this post, a close near this resistance suggest that bulls are in control. We have F&O expiry ahead of us. How to trade Nifty in coming week? 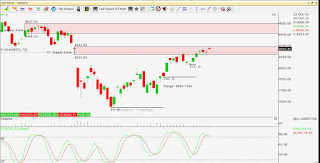 Technical Overview: Last week Nifty made high of 8328 and low of 8217. A range of 110 points. This is a small range. From very short term perspective we can assume that bulls are seen exhausted and not finding it easy to cross the resistance at 8322, though from medium term perspective bulls have control over bears. Bears have still not given up. Bulls can take markets up to 8400. But even at this level Nifty would face stiff resistance to move up. The question is can we see some dip from here? Or will Nifty move up and reach level of 8400. This is what I feel: Currently there is no major news on which Nifty can react. Corporate results are causing mixed sentiments "Kahi hushi Kahi Gum", however on 5th Nov, once the BIHAR polls are over, much depends on result of Exit polls. Let's expect Nifty to give us clear direction. From trading perspective we expect choppy market conditions in coming week. It is not easy to trade these choppy markets. Better to stay away. I always ask traders to identify their objective of trading and then decide the amount to risk they can afford to take for that objective. It is not easy to speculate the markets. I do not count the returns of my advisory based on couple of calls. I always treat my advisory like a portfolio and count returns for whole month or year depending on objective of portfolio. Click here to read more about my "Prime Cash" portfolio. This portfolio invests in Cash socks for short to medium term. I also run trading portfolio in Options for conservative and comparatively safer returns of 3-5% per month. Click here to read more about "Index Options" portfolio. The trades are given for education purpose. Traders are advised to read disclaimer. Most trades given here are making profit week on week. However implementation is very important in trading. I believe that most of the time traders lose money due to psychological pressures and poor risk management. I run some portfolio for different class of traders as per the risk appetite and investment capacity. The returns are not measured for one or two calls but for all the calls for certain period say a month or year. I believe in protecting whatever is earned. Check the details of my portfolio here. We have had a relatively flat week in terms of Nifty closing behind us. Bulls are not giving up. Global cues were mostly mixed with positive bias. 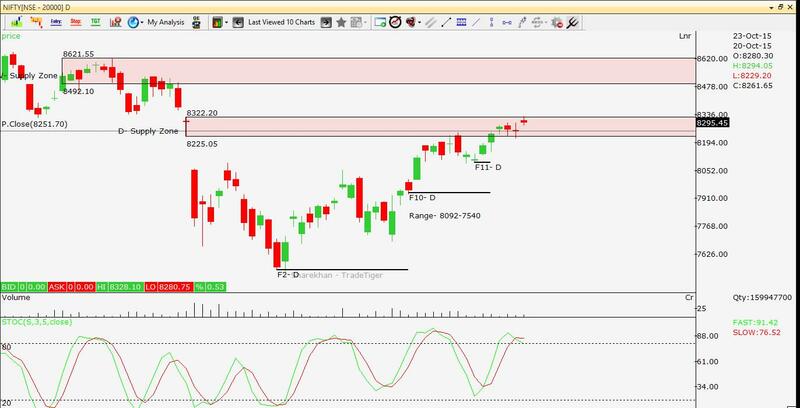 Technical Overview: Last week Nifty made high of 8246 and low of 8088. A range of 158 points. This is relatively a small range. Bulls have regained control in last 2 days of last week. Nifty has made "Hanging Man" pattern with formation of a "Doji" candle on weekly chart. This suggests top formation. Nifty is also trading near resistance at 8225-8322. This area is still intact. In last post I had said that, we man not assume uptrend unless Nifty breaks 8322 to close above this area. Wait patiently for Nifty to give clear signals and then take a trade. This is what I feel- Nifty may not be able to cross 8322 so easily. A possible dip can come and may take Nifty down to 8000. I had expressed same view in last post too. Let's see how things pan out. However one should understand that currently bulls are in control, hence not to go for outright short trade. Most trades given here are making profit week on week. However implementation is very important in trading. I believe that most of the time traders lose money due to psychological pressures and poor risk management. I run some portfolio for different class of traders as per the risk appetite and investment capacity. The returns are not measured for one or two calls but for all the calls for certain period say a month or year. I believe in protecting whatever is earned. Check the details of my portfolio here. On daily chart one can see lot of basing near 8225 resistance (Supply area 8225-8322). Today's weekly closing is crucial. An anticipated Hanging Man on Nifty on weekly chart is possible- may not be a good sign for Nifty to continue its up-move. I believe in protecting whatever is earned. Check the details of my portfolio here.